Visit FishWest online at FishWest.net which is committed to providing the best fly fishing equipment available on the web. FishWest carries rods, reels, line, flies, tackle boxes, accessories and much more in their huge inventory! 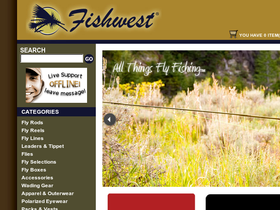 FishWest offers brands such as Cortland, DiamondBack, Echo, Hardy, Redington, Ross Worldwide, Sage and many many more. Be sure to visit 58Coupons.com for FishWest coupons, FishWest discounts and FishWest promotions. Head on over to FishWest.net where you can save up to 60% on Specials & Closeout Items. Click link to start saving. Place an order at Fishwest.net and receive free shipping on most everything! Click link to start shopping. Shop at FishWest.net and save 50% on select t-shirts! Click link and check it out. Shop at FishWest.net and find select fleece tops at a 50% discount. Click link for this great deal! Check out select wading boots at FishWest.net and get up to 44% off! Click link and save.